This window is on the right third of the BW8 program (see below). It is divided up into preset tabs, a few of which are new in the upgrade from BW7. 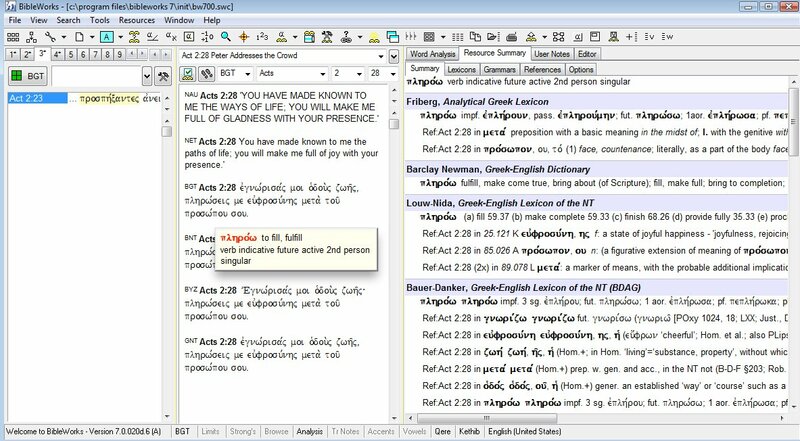 The new tabs include a cross-reference feature* (just a convenient link up with the Treasury of Scripture Knowledge see below), a “words” tab (a sort of quick-reference of a word you searched for in the context of its version and within its own search results), and a “context” tab (which divides the window into three parts, showing you a frequency list of words in your given pericope, book, and chapter, respectively). I think the context tab is the most helpful addition to the analysis window because it can serve as a sort of quick-reference to see the most common words in a given passage, book, or chapter (though you have to scroll past insignificant high frequency words like articles, pronouns, and prepositions). I should also mention the “stats” tab which contains a customizable bar graph reflecting your latest search. 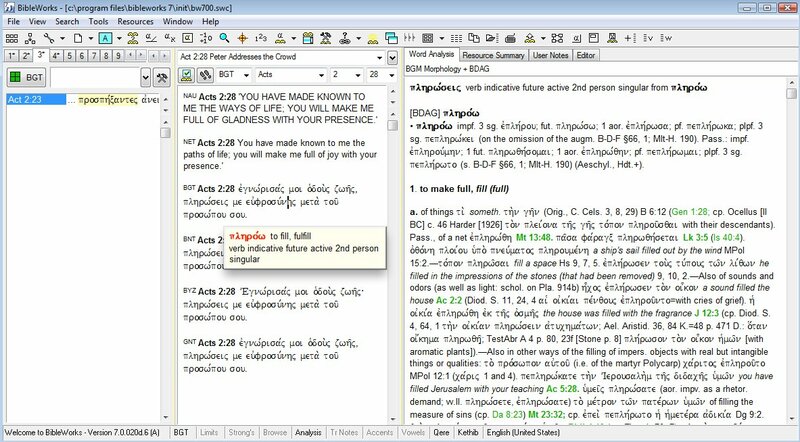 Even though Accordance has added new instant details features to version 8, BibleWorks still has the edge in speed: When I hover over a Greek word, I have instant parsing information in the right pane with the BDAG (or your default lexicon) entry immediate following. If I desire, I hold ’shift’ and move to the BDAG entry to scroll (all in the same pane). Further, I can set this right pane to list various resources with the result that hovering over a word will call up relevant grammatical topics (based on gram. 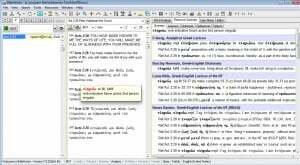 tags), lexical entries, and/or relevant Scripture references in these resources. As I move the cursor to another word, the pane instantly displays the new information. This combination of power and speed is unrivaled in the other programs. *Correction: The cross-reference tab is more than a link up to the TSK. In my default setting, my cross-references reflected TSK, but through the menu at the top of the tab, I can select other cross-reference resources such as the New Chain Reference Bible (Thompson, 1934), Nave’s, Torrey’s Topical Text Book, Stephan’s Biographical Bible, and cross-references from various Bible versions. 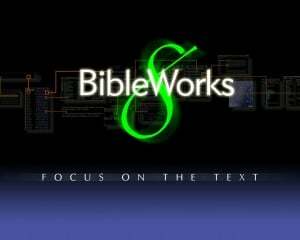 BibleWorks has also created a master list which cites the most frequently cited references across the other resources and presents them according to more or less frequently cited. Better yet, just create your own list based on your study! You can share these lists with other BW users, too. Click to enlarge (note: these screenshots reflect my BW7 program, thus you won’t see the tabs which are new to BW8).